FILE - A man looks at a washed away bridge along Umvumvu river following Cyclone Idai in Chimanimani, Zimbabwe, March 18, 2019. 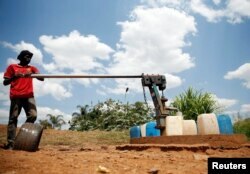 FILE - A man fetches water from a communal water point in Harare, Zimbabwe, Nov. 19, 2018. Water rationing is nothing new in Harare, but not in March. It more commonly begins months later, residents say.